You fill your water bottle before each workout because you know proper hydration is linked to exercise, focus and energy. These are three important reasons to keep your kids hydrated, as well. Whether your children like drinking water or not, there are plenty of ways you can help them get their daily intake. While these are the daily requirements, active kids should be hydrating frequently during exercise. Make sure they drink one-half to 2 cups of water every 20 minutes while biking, hiking, or running around outside. Your kids want to be just like you, so if you drink water, they may want to as well. Make it obvious that you love drinking water, and perhaps they'll model your behavior. Most kids cringe at the thought of guzzling a whole bottle of water. 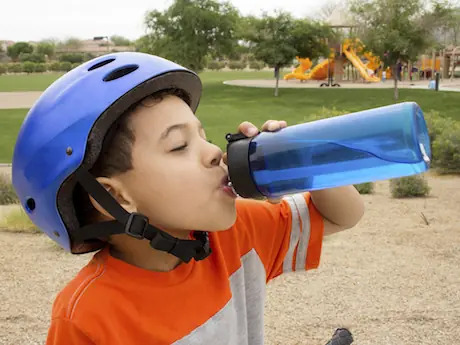 Luckily, there are a variety of ways active kids can stay hydrated, and enjoy doing it. Keep these alternative hydration tips in mind if your little one is less than thrilled about H2O. Feed them water-rich foods: Water rich foods count toward their daily intake, and can be key to keeping your active kids hydrated. Some options include grape tomatoes, celery, lettuce, watermelon, cucumbers, strawberries and peaches. Make watered down juice: Instead of going straight for water, add some flavor. Water down a bottle of 100 percent fruit juice or put frozen fruit in the water instead of ice cubes. This cools it down and adds pizazz.